Being a rookie in a new class can be quite the daunting experience. Being a rookie in a new class in a different type of racing can be downright terrifying. Yet Chris Fillmore took all of that in stride to take home his first ever win at Pikes Peak International Hill Climb. Chris Fillmore is well-versed in the art of motorcycle racing. Chris started in AMA Supermoto as one of the youngest riders on the grid at just 16-years old. From there he has worked his way up the AMA latter to eventually become one of the riders For KTM’s Factory Racing Superbike team. To race at AMA Superbike levels you must be good at two things; going fast, and going fast consistently. 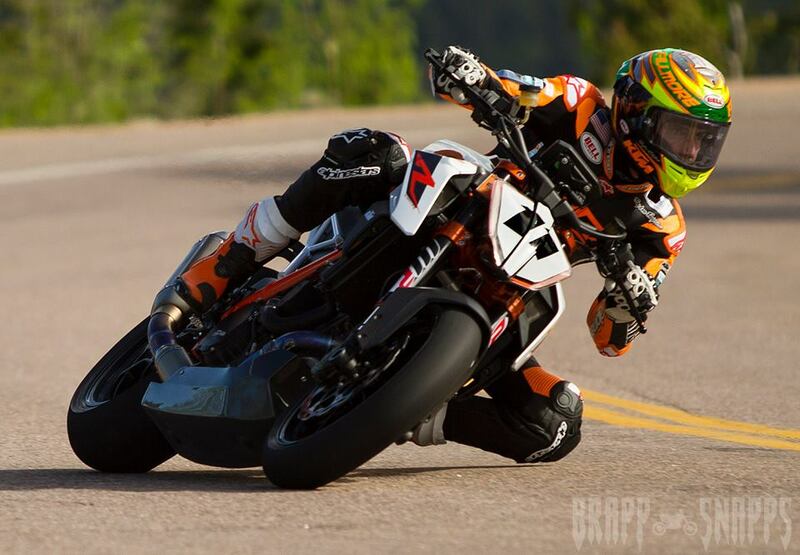 While Chris is no doubt a very talented rider, Pikes Peak is a different kind of animal than the road racing he is accustomed too. For starters it’s a stage race. Starting at 9,000ft competitors will race from point A to point B, covering 12.42-miles with a total elevation gain just under 5,000 vertical feet. Oh, and over that distance they will tackle 156 corners with grades approaching 11 percent in areas. It’s the type of course people spend years trying to perfect, in that regard it’s much like the Isle of Man TT. To make matters more difficult the riders don’t get countless laps to find the perfect racing line like they do on a circuit. No, Riders are given not much more than a handful of practice runs to figure out how to tackle this mountain in the least amount of time possible. Even with all of these odds stacked against him, Chris Fillmore initiated the track record to win the 95th running of Pikes Peak Hill Climb. While the bike used is a KTM it’s not the RC8 we are used to seeing Fillmore on. Instead he competed in the heavyweight class aboard KTM’s Factory 1290 Superduke R. The rookie finished his first ever timed run with a 9:49.625, eclipsing the track record that was set in 2012 by over 3 seconds. Being so high in elevation the race becomes a battle of attrition, with everyone gasping for air. This was most notable when Chris was doing his post-race interview where he had to keep stopping to take a breath. Lack of oxygen and a nearly missed corner couldn’t stop him though, and with that he has solidified his name in the record books. Check out the full on board lap below, and see just how brutal it can be to race up Pikes Peak.